The Holiday Inn Hotel Statesville. Conveniently located in beautiful North Carolina. Just hours to the beach and even closer to the Blue Ridge mountains. 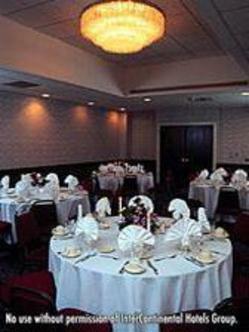 The hotel is located in historic Statesville near the major interchange of I-40 & I-77. Upscale hotel with marble floored entrance way We have beautiful meeting spaces to accommodate any size meeting from 2-250 attendees. The hotel is equipped with wireless high speed Internet access, 134 rooms on 2 floors, inside entrance to the guestrooms, Full Service Restaurant, Room Service, Lounge and outdoor pool free guest laundry. Rooms include a king bed or two double beds and one suite. This hotel's motto is do "Whatever it Takes" to satisfy our guests. This hotel is committed to providing accessible facilities under the American Disabilities Act. If your accessibility needs are not met, please contact the Hotel Manager on Duty. Should you require additional information regarding accessible facilities for guests with disabilities, please call 1-800-Holiday (U.S. and Canada) or contact the hotel directly. For the hearing impaired, TDD service is available at 1-800-238-5544 within the U.S. and Canada.